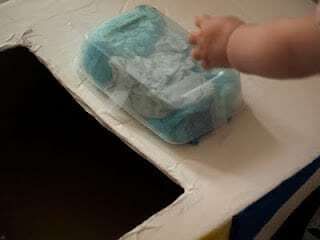 The cardboard box which our latest pram came in has been sitting in the kitchen for over a month. The children have had so much fun jumping on it and hiding inside, but this week it was finally time to do something with it. 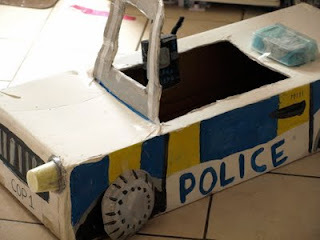 I asked my daughter what she wanted to make with it and she decided on a police car. 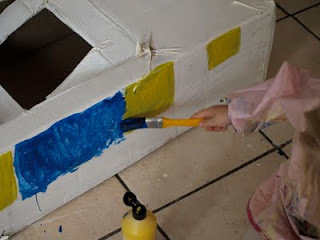 We looked at a few photos on the internet and she came up with lots of ideas how we could turn it into a car. These mainly involved her having a good idea to stick balls to the car as these were the main things she could see. 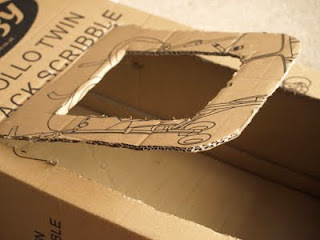 I cut a window in the box. It would have been easier with a craft knife but I couldn’t find one so scissors had to do. 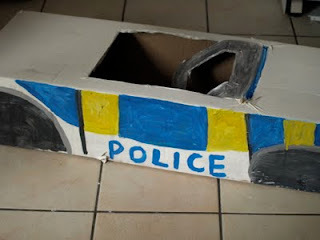 When the twins were in bed we painted the box so it looked like a police car. There was a little bit of incidental colour mixing when we ended up with green in the middle of the yellow and blue. 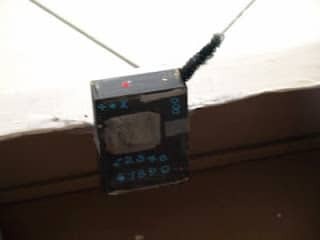 The radio was made with a small box. We stuck on numbers and a thick pipe cleaner. 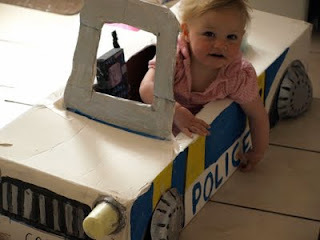 The blue lights were made with a take away box filled with tissue paper. This worked for the lights as well – this time using a jelly pot. Again a knife would have been useful as I couldn’t cut through the thick double layer of card and set the lights further back. The wheels were paper plates. Once the paint had dried it was finally play time.